The weather this week smiled upon First Lieutenant Ryan J. Nowlin as he made his debut as assistant director of the U.S. Marine Band, “The President’s Own.” (The previous assistant, Lt. Col. Jason K. Fettig, took over the director spot when Col. Michael J. Colburn retired last week.) Outdoor concerts happen at the mercy of D.C.’s summer weather, but stormy Monday and Tuesday yielded to balminess for his first two concerts leading the band on the west steps of the U.S. Capitol. I heard the second performance of the program, on Thursday night. If I ever get tired of this view of the band and the Mall, I guess it’s time to move away from the DMV. Not yet, though! Gustav Holst contributed the most substantial work on the program, his Suite in F for Military Band, four short fantasies on English folk tunes filled with wonderful sounds from the master orchestrator. As concert moderator GySgt Sara Dell’Omo noted, the Marine Band really likes marches, but they refrained from pressing ahead too fast in Holst’s, allowing the tune to blossom. The setting of “I’ll love my love” swelled with emotion, and the “Hammersmith” movement had a great charge from the actual blacksmith-y hammer used in the percussion. Nowlin and the band couldn’t quite synchronize the superimposition of two folk themes in the finale, though, and the result sounded a little tentative. Normally, the band handles any challenge thrown at it with ease, as proved in other selections on the program. In both Joseph Wilcox Jenkins’ “American Overture” and Henry Fillmore’s “The Circus Bee,” the band played like a single instrument: tossing off brass riffs in the former with a rhythmic energy and emphasis that induced excited dancing from the five-year-old in front of me, carefully grading the accelerando in the latter while maintaining maximum exuberance. John Philip Sousa’s “The National Game” marks another entry in that composer’s roll of catchy toe-tappers, and how is it that we don’t hear this march, written in honor of the National League by a D.C.-born composer, at Nationals games? It even has pratfall noises that one could sync with video of errors by opposing teams! The program cannily interspersed solos to vary texture, too. GySgt Frank Crawford played his tuba in Jean-Baptiste Arban’s set of variations, “Carnival of Venice,” which normally calls for the more nimble trumpet. The challenge did not faze Crawford. As the difficulty of the variations gradually increased to ludicrous levels, with the tuba seemingly puting nary a note astray, the crowd started applauding out of a combination of astonishment and relief like that for a tightrope walker who has made another safe traversal. By the end of the concert, more than a few passersby had been caught by the music; they made a ring of people behind the band, looking up at the Capitol Dome. The sun had set to the west down Pennsylvania Avenue, and the dusk had brought a touch of coolness to the air. Kids who had managed to sit mostly still for an hour of music had some more attention left to pay as the band roared through a transcription of Dmitri Shostakovich’s “Festive Overture.” To close, Nowlin and the band performed a stirring arrangement of “America the Beautiful,” followed by the Marines’ Hymn, which together had everyone on their feet. 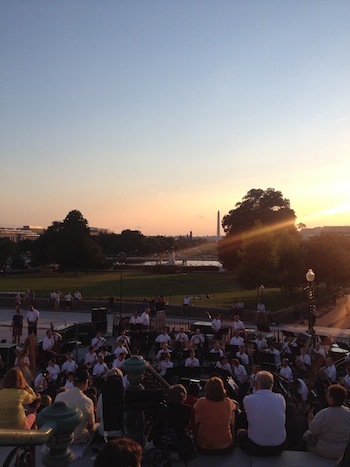 It was a perfect ending to an evening of light music in the shadow of our nation’s Capitol. The Army Band takes over Thursday nights at the Capitol next week for its excellent light-music performances, to add to its Friday night shows; I’m going to get over there before the summer ends. The Air Force Band and Navy Band seem to have mostly gotten out of the light-classical business, but you should go see concerts by them anyway. In the wintertime, you can hear these ensembles indoors, typically playing more substantial fare (here’s an example). Did I mention all these concerts are free? Pretty sure DMV Classical is the only outlet to cover this concert, but Anne Midgette coincidentally has written a piece on military bands in general, which I commend to your attention. You are currently browsing the DMV Classical weblog archives for July 2014.